← Pasta, flowers, and sunshine. I had the chance to go to the premiere of GOON: Last of the Enforcers last week. I was pleasantly surprised that I enjoyed the first one as much as I did (I am not a hockey fan, can I still say I’m a proud Canadian?) and am happy to report that the second, while bloodier, is even more entertaining. It’s rare to find a movie that has enough hockey to entertain fans, rom com elements for the gals, and comedy for everyone. I found myself thinking…hmm.. director Jay Baruchel has created his own style, dare I say, reminiscent of an Adam Sandler, it’s sometimes gross, constantly funny, and has the kind of heartwarming characters we fall for. Jay definitely has his own voice. Using the world of hockey that he is clearly passionate about, his movies not only fit the perfect package to market and get made (a challenge in Canada), but I get the sense that a new and unique Canadian voice has emerged. The tagline for the movie is “Hockey is hard, family is even harder”. For you hockey neophytes, a Goon is the player on the team known more for his fighting ability than his hockey skill. In Last of the Enforcers, our hero played by the adorable Seann William Scott (of Stifler in American Pie fame) gets injured and is forced to take a desk job. That’s all I’ll tell you. I promise you will laugh and maybe even tear up at the end. It’s a comedy about friendship, following your passion and the struggle not to let the people closest to us down. The ensemble cast is so lovable, some scenes so funny, that you can’t help but get swept up in the contagious fun. Single girl Mary played by Elisha Cuthbert steals a few scenes as the drunken best friend and Liev Shreiber who plays veteren Goon Ross Rhea cracked me up. I spoke to Marc-André Grondin who plays the passionate Xavier LaFlamme when the sequel was just an idea. 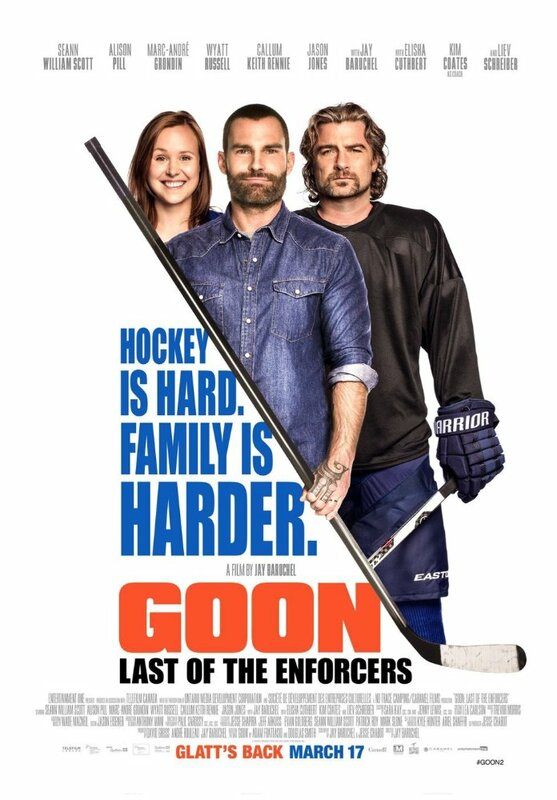 GOON: Last of the Enforcers opens March 17th in theaters! This is not a movie I would ever have watched – until I read your review! And thanks for the definition of goon, wouldn’t have know that either.